I have devoured books this summer at about the same rate as our great girl has devoured those chicken men mentioned in Friday’s post. Initially, I focused on reading spiritual/inspirational material during the day in small doses and fiction at night. After attempting to read The Evidential Power of Beauty by Thomas Dubay with children in the same room, it seemed better to switch my concept to light reading during the day and heavy reading at night. Dubay went the way of the nightstand. 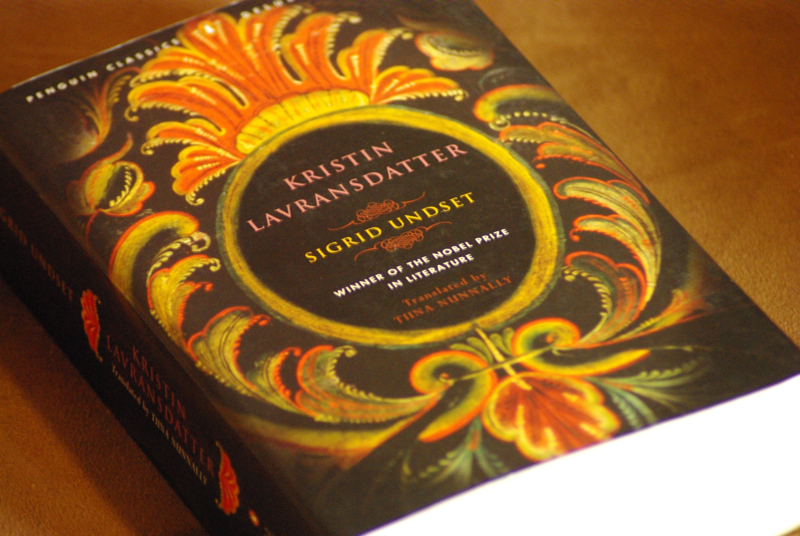 Since then my review of And Then There Were None, my evening books consisted of Kristin Lavarnsdatter, The Loved One, The Birth of the Republic, and, now, The Evidential Power of Beauty. My day books were The Memoir Project, The Art of Slow Writing, and The Magnolia Story. The more you read, the easier it becomes to read more. This list is not a standard by which every person should read. Ah, Kristin, you fool. This was my second reading and a much more lucid reading than when I first read it. This epic book is set in Catholic Medieval Norway where it is common to practice, and yet, not to practice Catholicism. Our hero makes some bad choices for love. The genius of the story comes in the realistic emotional fall out of those choices. There is no moralizing here, just an illustration of what happens when love fails to mature. We are creatures moved by good and bad inspirations. The author, Sigurd Undset, is a master at identifying those subtle movements of personality. Want to leave Netflix but do not want to miss the drama. Try Kristin. This Netflix original intelligence, not Party of Five. I highly recommend it for those who are not afraid of commitment (1200 pages). This is satire…hilarious, morbid, British satire. If you cannot handle dark humor, do not pick this book up. In this story, we see the commercialization of death through the mortuary business. The ending pushed me a little far (two suicides occur during the span of the book). If you liked The Royal Tenenbaums (I laughed out loud as Ben Stiller asked another character about whether or not he wrote a suicide note), this book is for you. I cannot recommend it for everyone. The Birth of the Republic. In July, my son’s hospital admission was more serious than others of late. That circumstance prevented me from writing about a remarkable gift we received: two donated tickets to the hit musical Hamilton. With revived historical interest, I picked up a book from junior year, U.S. History, taught by the extraordinary Mr. Wayne Hinds. I remembered liking this book, which reads more like a narrative than a text book. The book is very good, reminding me that there are many stories to tell from this period of history. Hamilton’s is one. This book answers the question of “how did this new country come about?” focused on what forces led to it: what perceptions, what ideas, what events furthered those ideas. It is half events and half ideas, an understanding approach that we do not need to dismiss our American heroes because they were also men. The author points out that these ideas were new. Even if they were not ready to take those ideas (like equality) all the way to their natural conclusion (abolish slavery, equal vote) we do not have to assume the beliefs were lies. High school level, so good for adults who have not read history in some time. The Evidential Power of Beauty. I have some progress to make on this yet. I love it thus far. The first section is a remarkable treatment of the concept of beauty, what makes a thing beautiful (across subjects), and what makes a thing ugly. The second section demonstrated the many awesome things in creation. To share on another day.